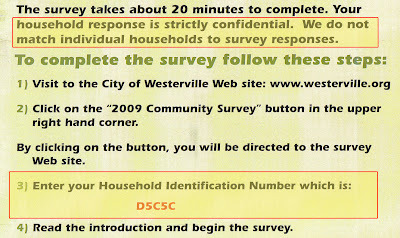 My hometown of Westerville is asking residents to take a survey about city services. 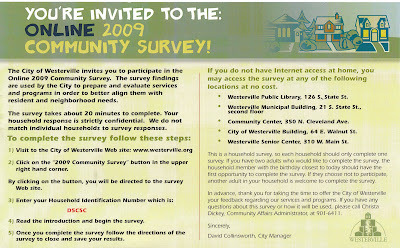 Postcards were sent in the mail to help residents get to the survey website. Nice. I really assume that they are not using this number to track residents, but rather the areas of town or perhaps to only allow one survey per household. But they probably should have called that number something a little different. This is how custody battles should be resolved in court. And if they share the same birthday as my parents do, then what? Hat size? In another lifetime I lived in Columbus and as I recall I've been to Westerville and there's no such place. Or at least there wasn't when I was there. Now I have to figure out what state it is I'm in. I get it: Edsel. I live in the state of Edsel. Without unique identification how would you handle forged responses?